প্রশ্নঃ আপনার প্রকৃত নাম, বয়স এবং ঠিকানা উল্লেখ করায় আপনার কোন সমস্যা নেইতো? প্রশ্নঃ আপনি এখন গণমুক্তি বাহিনীর কোন্ পর্যায়ে কাজ করছেন? প্রশ্নঃ আপনি কীভাবে গণযুদ্ধে যুক্ত হলেন সে সম্পর্কে অনুগ্রহ ক’রে কিছু উল্লেখ করবেন কি? প্রশ্নঃ ২০০০ সালে যখন পুরনো রাষ্ট্র ভয়ংকর হত্যাকান্ড চালাচ্ছিল, সেই জটিল পরিস্থিতিতে আপনি কী ক’রে ঐরূপ দুঃসাধ্য পথ অনুসরণ করতে অনুপ্রাণিত হয়েছিলেন? প্রশ্নঃ গণযুদ্ধে যোগদানের পর আপনি কীভাবে এ পর্যন্ত এসেছেন, দয়া ক’রে উল্লেখ করবেন কি? প্রশ্নঃ পি.এল.এ.-তে আসার পর কোথায় কোথায় যুদ্ধে আপনি অংশ নিয়েছেন? প্রশ্নঃ যুদ্ধে প্রথম অংশগ্রহণের সময় আপনি কেমন অনুভব করেছিলেন? প্রশ্নঃ এটা বলা হচ্ছে যে নারীরা পুরুষের সমান যুদ্ধ করতে পারে না? প্রশ্নঃ পি.এল.এ.-তে কী পরিমাণ নারী আছে? নারী এবং পুরুষের মধ্যে কোনো পক্ষপাতিত্ব সেখানে আছে কি ? প্রশ্ন: পি.এল.এ.-এর প্রাত্যহিক রুটিন কীভাবে চলে ? প্রশ্নঃ যখন আপনারা গ্রামাঞ্চল পরিদর্শন করেন, তখন অন্যান্য নারীরা কীরূপ প্রতিক্রিয়া দেখায় ? প্রশ্নঃ কিছু লোক বলে যে, পি.এল.এ-তে নারীদের উপর যৌন নিপীড়ন আছে? প্রশ্নঃ আমরা শুনেছি যে, পুরনো রাষ্ট্র আপনার বাবাকে হত্যা করেছে, তিনি কীভাবে নিহত হয়েছেন ? প্রশ্নঃ যখন আপনি আপনার বাবার হত্যার সংবাদ পেলেন, তখন আপনি কেমন অনুভব করেছিলেন ? প্রশ্নঃ পি.এল.এ.-তে যোগদান উপলক্ষে এখন আপনি কেমন বোধ করছেন? প্রশ্নঃ আপনি কি আত্মবিশ্বাসী যে লড়াই ক’রে পুরনো রাষ্ট্রকে সম্পূর্ণ উচ্ছেদ করা সম্ভব হবে ? প্রশ্নঃ সবশেষে আপনি কি কিছু বলবেন ? প্রশ্নঃ রাজকীয় সৈন্যবাহিনী কোথায় ও কখন আপনাকে ধর্ষণ করে ? প্রশ্নঃ ধর্ষণকারীদের কাউকে কি চিনতে পেরেছিলেন ? প্রশ্নঃ ঘটনাটা কীভাবে ঘটল আপনি কি সংক্ষেপে ব্যাখ্যা করবেন ? প্রশ্নঃ সন্দীপ জানতে পারলো কী করে? প্রশ্নঃ সন্দীপ ও তার পরিবারের লোকেরা সমস্ত ঘটনা জানার পর আপনার সঙ্গে কেমন ব্যবহার করেছিল? প্রশ্নঃ সন্দীপের বাবা আপনার সাথে কেমন ব্যবহার করেছিলেন ? প্রশ্নঃ আপনার চিকিৎসার ব্যবস্থা কে বা কারা করেছিলেন ? প্রশ্নঃ সন্দীপের শহীদ হওয়ার ঘটনা শুনে আপনার মানসিক অবস্থা কেমন হয়েছিল ? প্রশ্নঃ আপনাদের বিয়ে কীভাবে হয়েছিল ? প্রশ্নঃ আপনার মতে আপনার উপর একদিকে গণধর্ষণের আঘাত অপরদিকে শত্রুর দ্বারা আপনার স্বামী শহীদ হওয়ার ঘটনা, এর সমুচিত জবাব কী ? প্রশ্নঃ সারা দেশে আপনার মতো বহু নারী যারা এই ধর্ষণের শিকার তাদের উদ্দেশে আপনার বক্তব্য কী ? Sharpen the ideological struggle against the revisionists–the bourgeois. 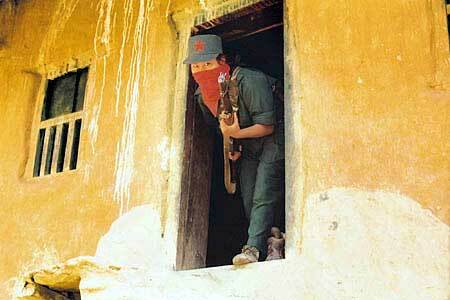 (On Thursday, May 19, Three Maoist Parties–Nepal Communist Party (Revolutionary Maoist) led by Com. Mohan Baidhya ‘Kiran’, CPN Maoist led by Com. Netra Bikram Chanda ‘Biplav’ and Communist Nucleus Nepal , led by Hemant Prakash Oli ‘Sudarshan’ have published a joint statement regarding the so-called Maoist unity between UCPN(Maoist) and other small factions. One of them there is a faction led by Ram Bahadur Thapa ‘Badal’ that just split with the Maoist party led by Mohan Baidhya ‘Kiran”. This ‘new unified party’ named as ‘Nepal Communist Party Maoist Center’ has accepted pluralism, multi party system and the current reactionary constitution of Nepal. It is a matter of surprise that these revisionists have declared themselves as the revolutionaries and their so-called Maoist center as the center of Nepalese Maoists. Not only this they have made Prachanda the renegade as their ringleader. In fact, it is not a party unity rather than it is a gathering of rightist opportunists, who have already lost revolutionary spirit, revolutionary ground and want to take part in the reactionary system. Indeed, they are trapped in a design, designed by the imperialist and expansionist forces. Just they are following the direction of their master. Today in the leadership of UCPN Maoist, some opportunistic groups of so-called Maoists have made a noise and whimper of party unity-a polluted wind. This unity between the rightist groups has produced a lot of confusion among the oppressed people and it is also dangerous for the struggle of the national sovereignty, people’s livelihood , people’s democracy and revolutionary movement. It is not a party unity, but a liaison between the rightist groups and we must go ahead sharpening the ideological struggle against this liaison. In the light of Marxism-Leninism -Maoism, we are dedicated for the New Democratic Revolution and to move ahead in the way to Socialism and Communism. To achieve this goal, it is necessary for the polarization and unification between the true revolutionaries. Therefore we urge the revolutionary people, our well wishers, and true Communists, not to be confused on such false unity and the noise and polluted wind of so-called Maoist unification, and we specially urge to stand firmly on the side of Revolutionary Trend of Nepalese Communist Movement. Last Week, a group of Maoists held a meeting in Dang district, western part of Nepal. Dang is known as the threshold of Rolpa, Rukum and Salyan-the Rapti Zone, the first base area of Ten Year’s People’s War. 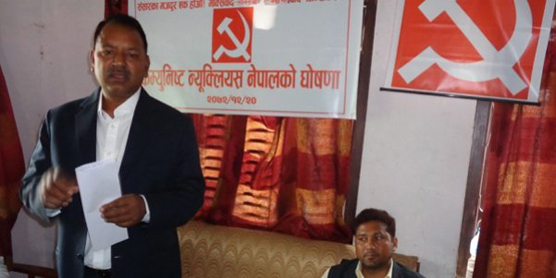 They formed a new Maoist Party–Communist Nucleus, Nepal. Comrade Hemanta Prakash Oli, known as Sudarshan, is the Convener of Communist Nucleus, Nepal. He was the first man who had taken responsibility of Base Area in the eve of People’s War. He was the Politburo member of the Communist Party of Nepal (Maoist) and division Commissar of 5th Division PLA, during the Ten Year’s People’s War. In 11 member’s Nucleus, most of the members are former PLA from the base area and the intellectuals from the urban area, who joined 10 Year’s People’s War. In an appeal released on April 2, 2016 they have appealed to join Nucleus to fulfill the task of New Democratic Revolution. 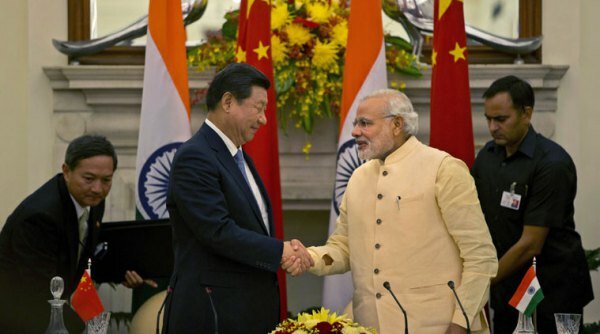 They have appealed also for the revolutionary polarization. In their appeal they have quoted the famous words of Comrade Mao : The seizure of power by armed force, the settlement of the issue by war, is the central task and the highest form of revolution. This Marxist-Leninist principle of revolution holds good universally, for China and for all other countries. 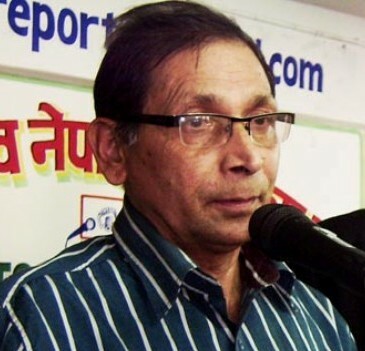 It is known to us that, these days Maoist party led by Mohan Baidhya ‘Kiran’ (now it is named as revolutionary Maoist), is facing massive internal dispute. Rapidly, it is going in the way to liquidation. A faction of this party, led by then General Secretary Ram Bahadur Thapa ‘Badal’ is going to merge his faction in the Communist Party of Nepal led by Prachanda. The faction led by ‘Badal’ has launched signature campaign against Kiran to join the UCPN (Maoist).This faction has accepted UNCP(Maoist) as the revolutionary party and Prachanda as a revolutionary leader. After the split of Badal faction, what the Kiran faction will do, is not clear. 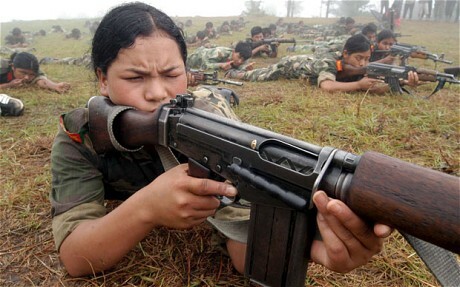 In document, Comrade Kiran has committed for the New Democratic Revolution through armed struggle. But in practice he has nothing to do. The main problem of Comrade Kiran is: not to move forward in practice. We all know, just to write in the document is not enough. Another party, The Communist party of Nepal, Maoist, led by Comrade Biplav also is not clear in the ideological and political line. In the place of New Democratic Revolution, Biplav party has replaced ‘Unified Revolution’. ‘Unified Revolution’ is the character of Nepalese revolution or it is the Party’s political line ? They have not made it clear. 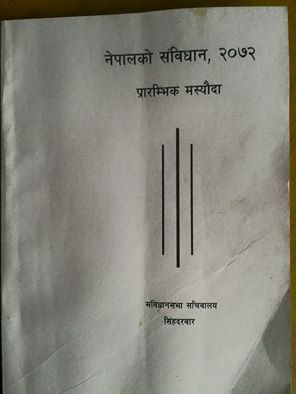 Their analysis about International Communist Movement and the character of Nepalese society also is not scientific. To some extent, among the all Maoist organizations the organization led by Biplav is dynamic. But the ideological and political line that they are pleading is ambiguous. In fact, they are still at the crossroads. Now the newly formed Communist Nucleus, Nepal has appealed the revolutionary cadres of all Maoist parties to join the Nucleus. There is going to be happened a new polarization of the Nepalese Maoist Movement. The revisionist will join Prachanda , the ring leader of Neo-reactionary camp and the revolutionaries will form a new revolutionary camp. There is a possibility of joint step between Nucleus, Baidhya led faction and Biplav’s CPN, Maoist. It is the demand of the time that later or sooner the revolutionaries will form a new center for the New Democratic Revolution guided by Marxisn-Leninism-Maoism. It is the fact that, most of the revolutionary leaders and cadres accept, that the revolution of Nepalese society is the New Democratic Revolution and without arm struggle we can’t achieve the goal of revolution. But in practice, they don’t want to move forward. What type of armed struggle? 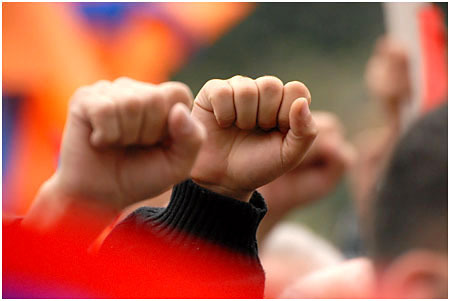 Ideological and political line is the issue that the Nepalese revolutionary comrades are debating these days. We want to make clear that there must not be any confusion, it is crystal clear that ultimately Nepalese revolution will take the road of Peoples War– Maoist Road of Nepalese character. The document of Nucleus also has stressed the following writing from Comrade Mao tse-tung’s famous document ‘Problems Of War And Strategy’. Every Communist must grasp the truth, “Political power grows out of the barrel of a gun.” Our principle is that the Party commands the gun, and the gun must never be allowed to command the Party. Yet, having guns, we can create Party organizations, as witness the powerful Partyorganizations which the Eighth Route Army has created in northern China. We can also create cadres, create schools, create culture, create mass movements. Everything in Yenan has been created by having guns. All things grow out of the barrel of a gun. According to the Marxist theory of the state, the army is the chief component of state power. Whoever wants to seize and retain state power must have a strong army. Some people ridicule us as advocates of the “omnipotence of war”. Yes, we are advocates of the omnipotence of revolutionary war; that is good, not bad, it is Marxist. The guns of the Russian Communist Party created socialism. We shall create a democratic republic. Experience in the class struggle in the era of imperialism teaches us that it is only by the power of the gun that the working class and the labouring masses can defeat the armed bourgeoisie and landlords; in this sense we may say that only with guns can the whole world be transformed. We are advocates of the abolition of war, we do not want war; but war can only be abolished through war, and in order to get rid of the gun it is necessary to take up the gun. It is the point to note that, if we are revolutionaries, if we are Maoists, without hesitation, we must follow the spirit and value of above mentioned writing of Comrade Mao tse-tung. To follow the Marxism means to apply it into practice.